Keeping the proper chlorine level should be a priority for all pool owners. There is some pretty general information everyone needs to know, and there is also some specialized education needed for some owners. Like snowflakes, all swimming pools are different based on needs. Even if the size and shape of a swimming pool is the same as another, there will always be a difference in the amount of chlorine a pool needs to be right. Chlorine is measured by ppm, which stands for parts per million. The lowest mandatory level is 1 ppm and the maximum is 3 ppm. There a number of factor, which affect the chlorine levels of swimming pool besides size and shape. If a pool has poor circulation or filtration, then it is going to require more chlorine. Also, extended exposure to sunlight is a factor. High algae content, the amount of junk in the pool and the size and number of the people using the pool are all factors as well. Finally, some pools will have a different pH because of the pH levels of the local water supply. Those factors are constantly changing because of environment and human behavior, and frequent testing the chlorine level is required to make sure the range of 1 to 3 ppm is maintained. Using a strip is one method of testing, and it is important to make sure the strip is not outdated. A reagent test kit is the other method. A reagent kit can produce inaccurate results if it has been exposed to direct sunlight, been frozen or contaminated in some way. If the pool is tested and the level is below 1 ppm, then it will need to raised. There are a variety of chlorine products available such as trichlor tabs, cal hypo granular, dichlor granular or lithium powder. 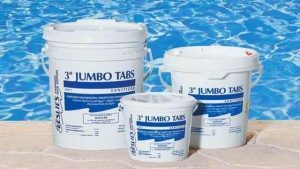 The majority of pool owners use trichlor tabs on a day to day basis. Pools can also have too much chlorination. Pools with too much chlorine may become an immediate safety risk and cause damage to pool equipment, which can result in increased expenses. People swimming in a pool with a chlorine level above 5 ppm will probably notice their skin, hair and eyes getting irritated or burning, and if the level is over 10 ppm, then no one should be in the pool because it is unsafe. Levels in a pool regularly high in chlorine can have a negative impact on the integrity of the pool. Pump seals, vinyl liners, pool heaters and parts of the filter can all be weakened by a high chlorine level. It is imperative to keep levels within the proper range for health and to keep expenses down. It is necessary to keep a stock of chlorine neutralizer on hand. If the chlorine level in a pool becomes to high, then a neutralizer may be able to lower it to an acceptable level. This product requires some attentiveness when using. Adding too much neutralizer to a pool with too much chlorine can take the pool to the other end of the spectrum, and the pool may fall below the acceptable level. Different kinds of pools require different levels of chlorine. For example, a stabilized pool requires a higher minimum level of acceptability for chlorine. The range of chlorine needed for one is 2 to 3 ppm. These pools use cyranuric acid to reduce the activity of chlorine. The reason the activity is slowed is to protect chlorine molecules from breaking down in UV light. Unfortunately, this can be problematic too. The lower activity is also lowering the kill rates of the chlorine, which means the more acid used, the slower chlorine works. Saltwater pools and pools with a supplemental sanitizer each have a variety of factors like a stabilized pool, which is why it is important to get help from professionals due to the myriad of requirements. Grand Slam Pools is the professional pool service naples fl needed to keep any kind of pool operating wonderfully . A variety of services like cleaning, repairs and maintenance are offered at affordable prices, and they are performed by Certified Pool Operators. Grand Slam Pools also takes pride in being a trustworthy business, which respects the privacy of all its clients.